First off, Happy 2 week birthday Liam! Today we had an early visit with Liam. Usually we go once Clint is off of work but today I had a doctors appointment so we were able to go visit Liam right after. It was nice because he seemed much more alert earlier in the day. 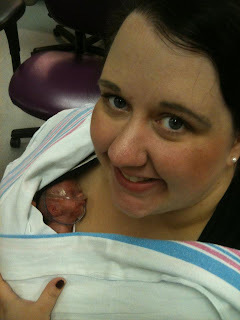 I was able to kangaroo care with him today and he did SO well! He didn't tolerate it well on Sunday so we didn't hold him Monday or Tuesday but today I was itching to hold him and I'm glad I did. He did let out a few cries at first as we were getting adjusted but after that we were so comfy. He was looking all around and responding to our voices, it was just great! Sometimes it's hard to believe all that has happened in two weeks until I see how much of a miracle Liam is, at times it can take my breath away. My sister Robin and Clint have nick named Liam and I, Kanga and Roo. The visit today was so so so good but in a way it made me sad. I wish I could just live at the NICU with him and not miss a second but that's hard to do with having a 3 year old. I was cleared to drive today at my doctors appointment so I hope that helps and I can visit more frequently. My hope is to drop Noah off at preschool and then go to the NICU while he is there and then go back in the afternoon with Clint. Health wise nothing has grown on his culture from yesterday which is good. However, he did have another blood transfusion today. I feel like every day there is new news and sometimes it's a step forward and other times it's a step back. Either way, spending time with Liam is the best.